This focus on ventilation is results of testing, both laboratory and acquired structure throughout the U.S. and unless you have been under a rock you are aware testing has occurred and the scientific data gathered is having a positive impact on the fire service. The blogs focus is to look at the vertical ventilation study and discuss a piece that has fallen through the cracks for some. We all understand any opening made in the structure is ventilation. When a door is left open, opened for entry, when a door or the roof burns through, when a window fails or is broken all affect the fire. Regardless of what caused the opening they all affect the amount of air entrained into the environment. All of these examples create a change in the pressure. Remember, flow path is the air movement from the high pressure to the low-pressure area. The fire, smoke (the unburned products of combustion that are just waiting for the right mixture to light off) and heat will move towards the low-pressure area. We should also have a clear understanding that when any opening is made we will get some lift of the products of combustion from the lowest points in a building. However, we will increase temperatures because of the flow path created and the introduction of more air will rapidly raise temperatures. Much of the focus has been on what we the fire service does to create these opening. But, few have looked in detail at the Impact of Ventilation on Fire Behavior in Legacy and Contemporary Residential Construction study. This study conducted by Under Writers Laboratories, Firefighter Safety Research Institute (UL-FSRI) published their findings in December 2010. When you dive into this paper on page 19 – 62 you will find a section that focuses on door and window failure. We all know doors and windows come in many shapes and sizes. We also understand they are made with many different materials and the focus is usually energy efficiency. But, let’s take a look how the building features that we have no control of impact the fire ground. There should be no questions on the difference of hollow core, solid or metal doors and if the door is a rated fire door or not. Each door will assist in confining the fire but each type will do so for a different period of time. Do you know the operational time frames that a door will hold the fire back? When sizing up your incident and looking to identify current and soon to be flow paths you must know the different types of doors and how those differences will impact your operational times. In part 1 of this blog we will focus on the window failure testing. In part 2 we will look at door failures and in part 3 and 4 we will look at fireground application. There were a number of different window failure mechanisms and degrees of failure observed during the experiments. In order to have an impact on the fire growth there has to be a passage for air to enter the structure, therefore the failure of interest was the breaking out of the glass as opposed to the cracking of the glass. Failure is defined as a passage through the window of 25% or more of the total glass area. In most cases this was the failure of the top or bottom pane(s) of the window but in some cases the top window sash moved downward, opening the window 25% or more. The two legacy windows with single glazing failed later than the four modern windows with double-glazing. 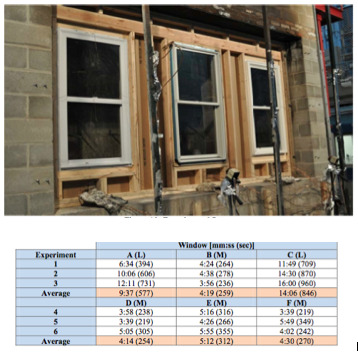 These experiments demonstrated a significant difference in legacy and modern windows exposed to fire conditions. In this series of experiments the legacy single glazed windows outperformed the modern double glazed windows in terms of longer failure times. It is proposed that this occurred for two reasons. First the legacy windows had thicker glazing than the modern windows. The legacy windows had glass thicknesses of 0.093 in and 0.11 in., while the modern window thicknesses were 0.087 in. Second, the method the glass was fixed into the frame differed greatly between the two eras. The legacy window glass was held in place with putty like substance and there was room in the frame for expansion of the glass. The modern glass was fixed very tightly into the frame with an airtight gasket and metal band, to provide better thermal insulation. This configuration did not allow for much expansion and therefore stressed the glass as it heated and expanded. The results of this testing goes against what my assumptions would have been. I assumed newer windows would have a greater time to failure. However these tests show there will be failures earlier in the incident with a modern type of window. Now consider your response times and crew efficiency. 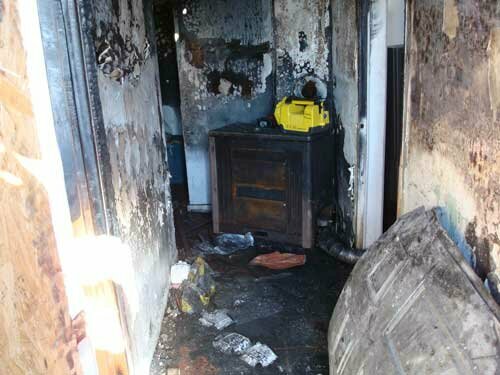 Where will your crews be in their tactical assignments when windows fail decreasing the time to flashover? Until next time remember, the clock is ticking and we must be able to predict what flow paths we will create and what flowpaths window failure will create that will impact our tactical assignments. In part 1 we focused on window failure. Now we will be focusing on door failure. When I was first taught to enter a second floor window without the protection of a hand line to search a bedroom (VES) I was taught to immediately close the door. I was also told if there was no door, find a door, take it off the hinges and put it in place. Today, many beat the drum that there is no reason to include the “I” (isolate) into the VES acronym. We have all heard it “if you were taught the right way we don’t need to add the I”. My reply back is why would we not want to add the “I” to make sure this critical piece of the skill is not ever missed. It’s that important and that critical to shut the door so why not? 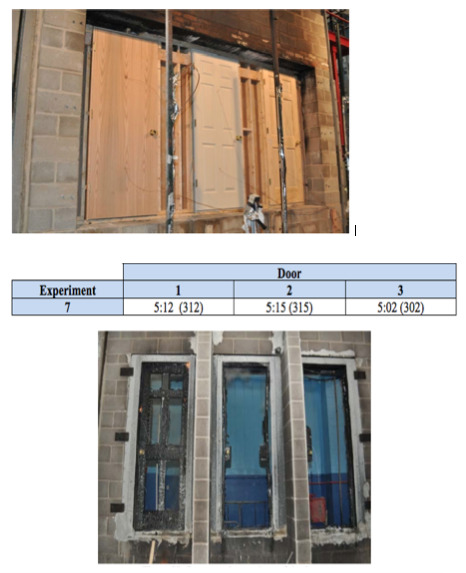 During the UL-FSRI testing they found the following results on the door burns. There was only one door failure experiment conducted. Failure was defined to have occurred when the unexposed surface of the door sustained burning. All of the doors failed at approximately 300 seconds. There was very little difference between the two hollow core doors. The fire ignited the unexposed side and quickly consumed what was left of the door. The solid core door had a similar failure time but the mechanism was different. Door 3 was a six panel door so where the panels were located on the door burned through because of its reduced thickness. The thicker portions of the door remained intact at the termination of the experiment. This experiment shows the fire containment ability of interior doors during a well-ventilated compartment fire is approximately 5 minutes. For the doors evaluated in this experiment it can also be concluded that the type of wood had no noticeable impact on failure time. 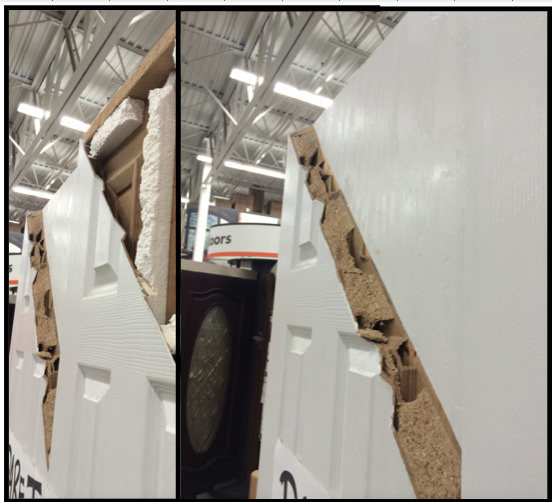 The doors evaluated in this experiment demonstrated that the type of wood had no noticeable impact on failure time. The failure time was dictated by the thickness of the door. The hollow core doors had the same overall wood thickness as the panels of the solid core door and therefore the fire breached them at very similar times. As incident commanders, officers and firefighters we must place a focus on timing. The timing it takes you and your crew to arrive, make the stretch and flow water. We must understand how long it will take your crews to get to the roof and open up. We must know how long it will take to mount a successful transitional attack. We must know how much time we have to commit companies to the interior. From the moment a fire starts, the clock is ticking. We must have a clear understanding what will influence that clock, how long we can safely operate and how long it take our crews to deploy and complete their tactics. While the science is advancing the fire service each and everyday it is important to remember Engineers can’t predict the time to failure and neither can firefighters. Hence the need to size-up, wear your PPE and SCBA when you are in a building that you think is on fire, cool the gases to take away the potential of a rapid transition to flashover if a window fails, and operate from a location so that you are upwind of the bulk of the exhaust gases if possible. Bottom line expect that the window or door will open/fail when you least expect it! We must begin to combine the research with our experience while watching the clock to increase our fireground coordination. We must begin to adapt our tactics based on the clock, construction type and how the fire is behaving from every inlet and outlet. We also need to be able to successfully predict new flow paths and take actions to prevent additional unnecessary flow paths on our fireground. This multiple part blog has been focusing on the ventilation factors that are present on the fireground. The factors in which we cannot control but have a significant impact on the operations. Part 1 focused on door failure while Part 2 focused on window failure during testing. If you have not read those parts please go back as the information presented are necessary pieces of the puzzle. The title indicates we are going to focus on tactical considerations. But first, we must ask; is it possible or necessary to consider factors we cannot control? Please let me answer that for you. It is absolutely necessary for officers, firefighters and incident commanders to predict what will and what may happen next. We must be two or three steps (at least) ahead of the incident. That statement highlights the necessity for all of us to spend greater time educating ourselves in fire behavior and building construction. If you can strengthen your ability to understand fire science and how the building construction impacts the fire you can then start making sound fireground decisions. This blog will focus on this topic looking at case studies. I want to bring real world examples to you not just theory. Real world case studies where one of our brothers paid the ultimate sacrifice. Captain Herbie Johnson from the Chicago fire department was killed in the line of duty on November 2, 2012. Capt. Johnson died saving his men. “He was trying to get us out but he couldn’t get himself out,” said firefighter-paramedic Mike Imparato. Today we write and learn from this tragedy so we can become better firefighters and officers with the goal of not repeating history. 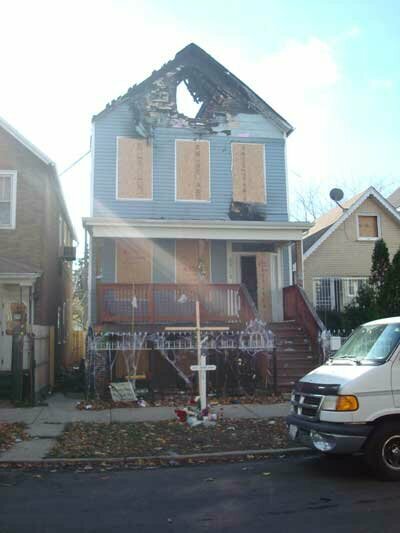 A National Institute of Standards and Technology (NIST) computer-modeling study of the 2012 Chicago house fire reveals the conditions that unleashed a surge of searing gases, leading to the death of a veteran firefighter. NIST examined the fire dynamics of the incident at the request of the National Institute for Occupational Safety and Health (NIOSH) and the Chicago Fire Department. Simulations conducted with NIST’s Fire Dynamics Simulator examined the fire’s temperature and pressure at various locations and the resulting flow path. With the agency’s SmokeView visualization software, NIST researchers also developed a graphical representation of the fire’s behavior and the conditions that firefighters likely experienced during the course of their interior operations. The simulation shows that fire in a covered back porch caused a closed steel-faced, wood-framed door to crumble, releasing pressure and causing hot gases to pour into the adjoining hallway where the victim and another firefighter were advancing a fire hose. The coincidental timing of the responders “interior attack” and the door’s failure proved to be deadly. In less than 5 seconds, the flow of gases caused the hallway temperature to soar, from about 60 degrees Celsius (140 degrees Fahrenheit) to at least 260 degrees Celsius (500 degrees Fahrenheit), the study found. Since 1999, NIOSH has issued reports on 15 fires in which changes in flow paths have resulted in 17 “line-of-duty” deaths of firefighters, in addition to civilian deaths and injuries to responders. Failure of a door or window, collapse of a ceiling, and uncoordinated ventilation during a firefighting operation are among the variety of factors that can rapidly alter a fire’s flow path. Including the Chicago tragedy, NIST has used its Fire Dynamics Simulator to study six fires that have resulted in firefighter deaths. Insights into fire behavior and thermal conditions gleaned from these studies have helped to shape research aimed at improving the safety and effectiveness of firefighters. NIST research, conducted with Underwriters Laboratories demonstrates that applying water from the exterior of a burning structure—before attacking the fire from the inside—can reduce the potential for high-speed flows of hot gases to develop and ignite. While there is still more data that needs to be gathered it is clear that water reduces temperatures and takes the energy away. Some feel this takes the focus off of the victim and onto the fire. Some debate we must put the victim first. I couldn’t agree more! The victim must always come first! Transitional attack has its place on the fire ground and as we saw in this video water cools the environment and saves lives even Firefighters lives. Applying water will cool the environment, decreasing the chances for window and door failure, which in turn decreases the flow paths. It is clear that we must control the building. We must extinguish the fire. We must get water on the fire the quickest way possible. And to clarify my statements through the window is not for every fire or every situation. However, it must be a tactical consideration to save lives, extinguish the fire and control the building.